It’s inevitable … you will get negative online business reviews. How you handle these negative reviews is critical. Get it wrong and you can really hurt your own business. But here are five ways you can turn negative reviews into a positive for your business. 92% of consumers read online reviews to determine if a local business is a good one. Keep a close eye on your company’s business reviews. Yelp, Google and Facebook are the three most important local business review sites, but you might have some other regional or industry-specific sites that you’ll want to monitor too. You WILL get negative business reviews … and that’s not necessarily a bad thing. No business is perfect. A few negative reviews mixed in with a lot of positive reviews actually lends credibility to your business. A business with only glowing, 5-star reviews seems suspicious to consumers. Don’t ignore bad reviews – A negative business review means you have an unhappy customer and a good business will want to try to make things right. How or if you respond shows other potential customers how you’ll work with them too. Don’t respond immediately – It’s tempting to reply right away to a negative review. But before you respond, take time to really look at things from the consumer’s perspective. Think about it for a while and be sure to cool off. A rash or unprofessional response will only hurt your business. Keep your reply short, simple, and professional – Empathize with the consumer’s experience and ask them to contact you so that you can help make things right. Nothing else is needed and you’ve just scored major points with anyone else reading through your business reviews. Don’t respond more than once – Don’t get into a back and forth argument with a consumer online. It’s not productive and only reflects poorly on you. Encourage more positive reviews – Ask your other customers in-person to review your business online. Don’t be pushy or annoying, but a couple negative business reviews don’t look that bad when they’re outweighed with a lot of positive reviews. 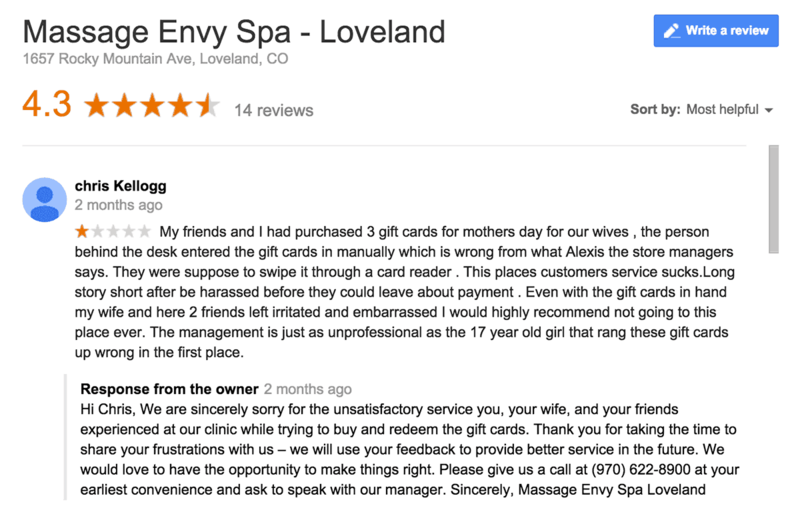 Massage Envy did a great job of responding to a negative business review.